After reading over the answers it became very obvious to us that many of you are still trying to wrap your head around protein intake. How much do you need? Where do you get it? Are you getting enough? To be honest I am not surprised that there is so much confusion surrounding this topic. Most of us have been conditioned to picture cheese, eggs and a leg of lamb as soon as we hear the word protein. Did you know though that every – yes, every – whole food contains protein? From your morning banana to your evening salad, finding plants packed with protein is easy to do. And not only is it easy to do, it is easy for your body to use. I say it all the time. Contrary to popular belief, it is not only possible to optimize your health on a plant-based diet; when done right, I actually recommend it. So why is protein intake so important? Protein is an essential nutrient that plays a key role in how our bodies function. But too much protein is associated with several diseases. It is more important to eat a varied diet than to isolate and focus on any one nutrient. Including more plant sources of protein will also offer more health benefits including more fibre and nutrients. In traditional nutrition, it has become accepted that we need protein and LOTS of it. In fact, you could even say we’re a protein-obsessed culture. But in the plant based world, were always told you get all the protein you need from broccoli (a slight exaggeration but you get the picture) and that plant sources are just as adequate, if not better than animal sources of protein. Yes, as a society, we are likely too obsessed with protein, especially animal protein, however from my personal experience, I came to understand that some people need more protein than others, myself included. I talk to people who’ve tried plant-based diet and just felt like they weren’t getting enough protein. This happens! The more clients I work with, I realize there is something to be said for bio individuality, the concept that we are all different (or that, at least, we all fall into several different groups of shared similarities). As I mentioned earlier I’m a firm believer that we can all thrive on a plant-based diet, however, I also believe some of us need to tweak this diet to match to our own needs. While for one person a green smoothie keeps them satisfied until noon, another person might be starving by 10am. Put simply, some people just do better when they have more protein in their diet. I find athletes, and really busy people have a higher protein need (as do children and pregnant women). For my clients I always recommend starting lighter on protein for one or two, or more days and then listening to your body. If you feel like you’re missing something, try adding some raw brown rice protein powder to your smoothie or juices and take another listen to your body. 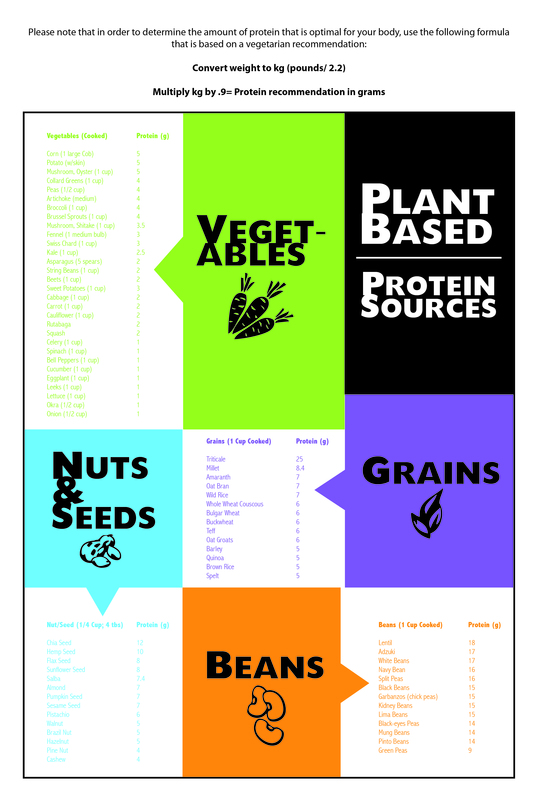 Look at the chart bellow the article for more information on protein needs however for now rather then obsessing with numbers try to establish a connection with your body and listen to your body’s needs. But where do you I get protein? Despite deeply ingrained but misleading conventional wisdom, the truth is that you can survive without meat, eggs and dairy. Believe it or not, you can actually thrive, and never suffer a protein deficiency. Because no matter how active your lifestyle, a well-rounded whole food plant-based diet provides more than enough protein to satisfy the body’s needs without all the artery-clogging saturated fats that dominate the typical North American diet. A grain like seed, quinoa is a high protein alternative to rice or pasta, served alone or over vegetables and greens. It provides a good base for a veggie burger and is also a fantastic breakfast cereal when served cold with almond or coconut milk and berries. Oatmeal – 1 cup = 6 grams. A fermented soybean-based food, tempeh is a healthy protein-packed alternative to it’s non-fermented cousin tofu. It makes for a great veggie burger or over brown rice and vegetables. An excellent substitute for beef, fish and soy products, one serving provides about 25% of your RDA of protein. However it is not recommended for those with gluten sensitivities, as it is made from wheat gluten. A blue-green algae, spirulina is a highly bioavailable complete protein containing all essential amino acids. At 60% protein (the highest of any natural food), it is a plant-based protein powerhouse that I include into my power smoothie on daily basis. What about incomplete Proteins and Amino Acids? We’ve all heard that plant protein is “incomplete” compared to meat protein, and that plant foods have to be carefully combined to make a “complete” protein. But that’s just an urban legend that was never based on science. The term ‘incomplete protein’ refers to foods, which have all the essential amino acids, but are low in one or more of them. That’s called the ‘limiting amino acid’. Most plant foods have one or more limiting amino acids, which limit the availability of all the other amino acids in the food. That’s why these foods are called ‘incomplete proteins’. For example, the limiting amino acid in grains is usually lysine (Lys); in legumes it can be methionine (Met) and tryptophan (Trp). So, the low level of Lys in grains is complemented by a higher level in legumes, and vice versa, to make ‘complete protein’. However, vegetarians and vegans don’t need to worry about complete and incomplete protein. 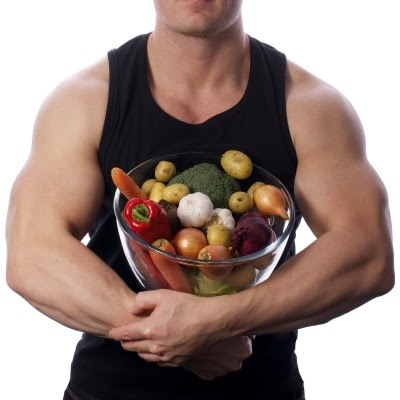 It is NOT NECESSARY for vegetarians and vegans to combine specific protein foods at one sitting to make complete protein.